This category includes all four articles in the Start Here chapter. In Section 1.1, we begin with a summary of the many benefits of building your website with Joomla. Because so many website owners make the mistake of trying to use Wordpress for their website, we include a precise explanation of why Wordpress websites eventually turn into a poorly organized mess. In Section 1.2, we provide a history of the Internet and web building tools to help you better understand where the Joomla web building platform fits into the bigger picture. In Section 1.3, we warn of major problems that have led to many online businesses being forced to shut down – and how you can protect your online business from this problem. In Section 1.4, we review essential steps for securing your online business domain name and web hosting. Questions? Feel free to post any questions on our course website forum! In this article, we begin with a summary of ten general benefits of building your business website with Joomla – the world's most powerful web building tool. We then describe ten specific reasons why Joomla is better than Wordpress for building a modern interactive website. Joomla’s easy installation and intuitive administration panel make it very popular with users who want a website they can control – without the need to know any computer programming - while also being packed with thousands of optional features. Joomla sites offer several advantages over other web building platforms. 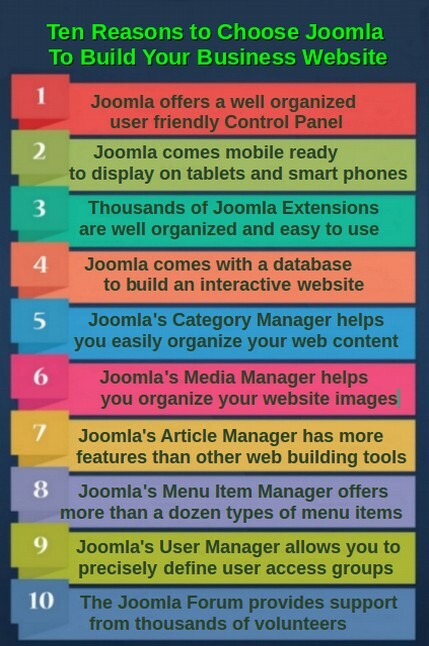 Below are the top ten reasons you should use Joomla to build your interactive business website. From the beginning, Joomla sites offered several advantages over other web building platforms –especially in the area of Content Management. The Main Menu of the Joomla Control Panel is much better organized than the Main Menu of the Wordpress Dashboard or any other web building tool. Joomla also provides a series of Quick Links which are not found in Wordpress. 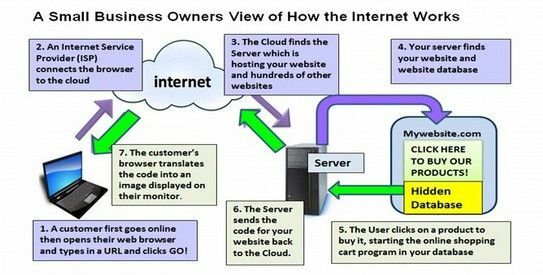 Two of the first steps in building your interactive website is obtaining your domain name, such as myinteractivewebsite.com from a domain registrar and selecting a web host for your website. Some companies register domains and provide servers to host websites. There are not major differences in price between domain registrars. The wholesale annual cost of a domain name is about $8 per year and registrars charge about $12 to $15 per year for domain names (especially after the first year). However, there are major differences between the policies of various registrars. There are also major differences between the policies and prices and reliability of different web hosts. So it is important to spend some time on each of these decisions. If you have read any of my past Joomla instructional websites or books, you know that for many years, I used and recommended the world's largest web host and domain registrar, GoDaddy. However, recent events have caused me to change my mind about hosting any website in the United States or using any domain registrar in the United States. In this section, I will explain my reasons for changing domain registrars and web hosts and the process I used to find a new domain registrar and a reliable non-US web host. It is not easy to find a good reliable web host. With so much profit to be made in the web hosting business, the bad web hosts greatly out number the good ones. If you are thinking about moving your domain name out of the US or getting a new web host, we present some useful advice in this section. 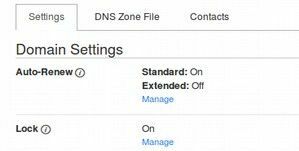 Then in Section 1.4, we describe the exact steps of securing and/or transferring your domain name and web hosting to a new registrar and web host. On August 8, 2013, the NSA forced Ladar Levison, the owner of a small secure email business called Lavabit, to either turn over all of his data or shut down his online business. Ladar chose to keep his promise to his customers. He shut down his business. Until it was shut down by the NSA, Lavabit had 400,000 users – all of whom lost access to their email accounts. One of Lavabit's customers was Edward Snowden. The NSA justified shutting down Lavabit with what they call the “Three Hop” Rule which, according to the NSA, gives them the right to all of the data of anyone who has any relationship to anyone who has any relationship to an NSA suspect. Since Snowden is an NSA suspect and since the 400,000 Lavabit users are on the same email database as Snowden, the NSA got to download all of the data of all 400,000 people. In case you were wondering, those 400,000 people were just the second hop. Anyone who knows any of those 400,000 people is the third hop. In other words, nearly everyone in the world is included in the third hop. I too am deeply concerned about the NSA attacking and/or shutting down online businesses that it does not like here in the United States - including important online privacy businesses such as Lavabit, Silent Circle and the TOR project. I am also concerned about NSA treatment of whistle blowing heros such as Jacob Appelbaum, Glenn Greenwald and Edward Snowden – all of whom have been driven out of the US simply for defending online freedom and online privacy. In order to protest the NSA takeover of the Internet in the US, and in order to protect my own websites and those of thousands of my students from a NSA takeover, I have decided to move my websites and online business to servers located outside of the United States. In Section 1.3, we described why you should move your website to a hosting company in Canada and why we recommend a relatively small Canadian web hosting company called FullHost. In Section 1.4, we will review the exact steps to transfer your Domain Name to FullHost and the steps to migrate your small business web hosting to Full Host. While these are independent processes in that you can transfer your domain name without transferring your web hosting – or transfer your web hosting without transferring your domain name, there are some steps common to both. We will therefore start with the common steps. Your plan of action should include unlocking your domain names, updating your applications and then backing up your website. You might also want to update your domain name contact information. However, you should be aware that if you change even one thing on your domain name contact information, GoDaddy will lock your domain name and prevent it from being transferred for 60 days! You therefore may want to transfer your domain name even with outdated information and then update it AFTER it has been transferred to FullHost. After your domain is unlocked and your data is backed up, you can change your domain name registration to a Canadian registrar and select one of several migration methods to your new web host - depending on the status of your current websites. Ideally, it is best to purchase your domain name from the same company you want for a web host. So if you do not already have a domain name, it would be best to first set up a shared hosting account at FullHost (the annual fee is about $60 per year) and then buy your domain name from them (the annual fee is about $15 per year). However, because GoDaddy accounts for well over half of the website hosting market, I will describe the process if you already have your domain name through GoDaddy of transferring your domain name to FullHost. If you have a different US web host, the process is about the same. If you are like most small business owners, you started your online website years ago and likely did not have time to keep your hosting account information up to date. Before you change, log into your account and make sure all of the information is correct. Click on My Account at the bottom of the page. Then click on the green Domains, Launch button. A list of your sites will appear. Click on a domain name to open it. If lock is set to On, click on Manage and change it to Off.